Astronomers in South America were attempting to calculate the size of the asteroid known as Chariklo. Chariklo resides in orbit around the Sun between the planets Saturn and Uranus. Last June, Chariklo was due to pass between astronomers across South America and a distant star in the Scorpio constellation. They planned to measure the time of the mini-eclipse and using the known orbital speed, deduce the size of the asteroid. What they didn’t expect to see was two short flickers of light before and after the asteroid eclipsed the star. These brief flickers suggest Chariklo has its own simple ring system orbiting the asteroid. 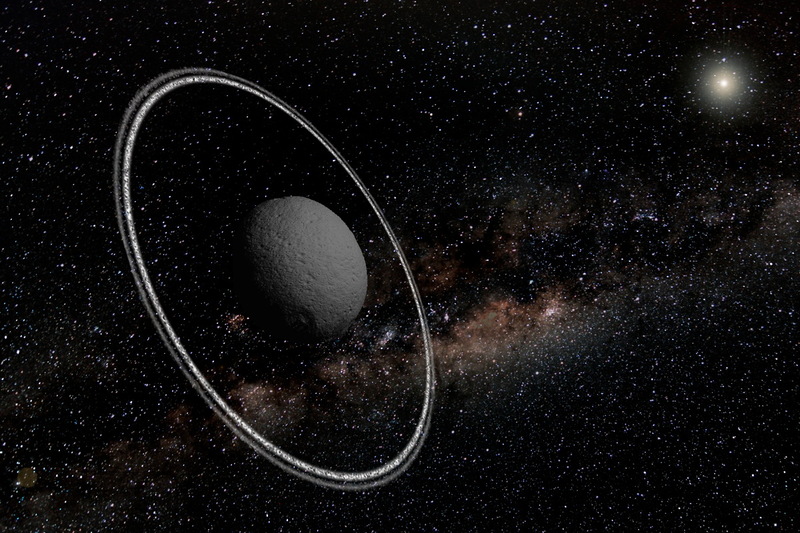 This discovery means the asteroid is the first non-planet object found to have a ring system. As to the original observational goal, the team of astronomers were able to calculate Chariklo has a radius of 124 kilometers. Their surprise discovery showed two rings orbiting the asteroid at 391 and 405 kilometers. Sweet Zombie Jesus! 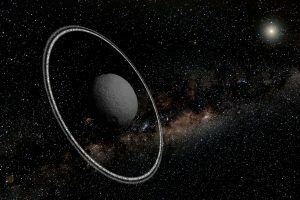 How can an asteroid have rings? It doesn’t seem like there would be enough mass there to trap anything. Wouldn’t solar wind eventually blow the rings into higher orbits until they reached escape velocity? There’s more to it than what we can see. ← NIST Has A New Clock!